Now, we’re taught to aspire to achieve all that we can achieve, even to the point of driving ourselves into the ground. We’re taught to throw as many irons in the fire as humanly possible without totally losing our souls. I can relate, as I’m sure you can too. Even if you’ve chosen the homemaker/stay-at-home mom path, you probably feel guilty for not contributing to the family finances more; if you work full-time, you probably feel that incessant guilt that you’re not the best mom OR the best employee; if you work part-time, you struggle to maintain balance while always feeling like you’re behind (okay, this is probably true for everyone, hands down). The false bill of sale is that you can have a career, have passions and hobbies, have a husband, have some children, have a flourishing spiritual life, have inner peace, have a plethora of volunteer opportunities on your schedule, but with it will come a side order of stress, chronic illness, and unrest. There is no real way to have or do it all. It’s actually, a big fat lie. It’s January as I write this, and we’re all supposed to be goal planning, dreaming big, aiming to have our best year ever – listening for God’s incredible call on our lives and awaiting lightening bolts of inspiration. How can I improve? How can I achieve more, without cutting anything out of my life? How can I really be successful in all areas without anything in my life suffering? It just isn’t doable. It’s pie-in-the-sky, people. Sounds ridiculous to even write it down. Why are there so many HGTV shows about Tiny Houses and Netflix documentaries on simplification and minimalism? It’s because overwhelming majority seems to think that cutting stuff out, doing less while being more intentional is the only way the only way to be happier. While I don’t agree that being a minimalist is the total key to maximum joy, there is truth in not cramming one’s schedule, one’s house, one’s mind so full that we have no room to breathe. The answer lies somewhere in the middle of doing less, saying ‘no’ more, asking for more help, allowing ourselves to relax and let things go if we need to in order to find some peace, joy, and margin. Sometimes the answer is bigger and involves quitting a job, downsizing, moving, or changing the fundamental balance in your marriage (good luck with this one). How will saying ‘yes’ help me with what I already have to do? Am I already doing everything in my life well? I’m not always the best at this; often I’ll say ‘yes’ to something only to regret it the next day or week, then try and eek out of it when my schedule blows up. Saying ‘no’ at the outset is much simpler and less embarrassing. I’m my own worst enemy, and I often get in my own way and make the most work for myself. As you look at 2017, what does “Be All That You Can Be” look like for you? Does it mean less work, more time to yourself? Does it mean more focused time with your family when you’re home with them? Does it mean saying ‘no’ to the wrong things and saying ‘yes’ when you have time and energy for something that you love to do? I wish that in this short article I could solve the ‘having it all’ dilemma all women face. For me, reducing expectations has been the only way to match up what I’ve got to what I want, and that can make all the difference in the world. Now, what can you reasonably omit so that you can gain a little peace back in your life? For a different take on this, here are some thoughts from Miyoko Hikiji, author of the book: "All I Could Be - My Story as a Woman Warrior in Iraq" excerpted from her post titled: Be All You Can Be, The Army Motto that Inspired a Generation . 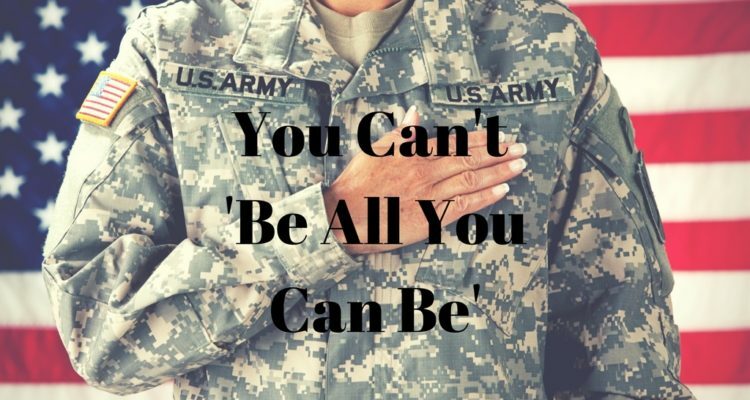 . . “Be All You Can Be” was the Army’s slogan for 21 years and for good reason. It worked. It inspired a nation of young people to become their best by entering into military service; what really could be more truthful. It certainly was for me. Three years in the active duty Army, five years in the National Guard and one year deployed to Iraq made an indelible print on my life. That impression, like a fingerprint, shares characteristics with other military members’ impressions, including putting the mission above all, being prepared for and efficient in all working conditions—indoor or outdoor, physical and mental—adapting and overcoming in order to get the job done, never giving up, being a good leader and team member and always, always keeping that “can-do” spirit. . . . Be All You Can Be. It’s a motto that doesn’t require all of us to become doctors or generals or astronauts or best-selling authors (though some of us will), but it does demand that we embrace our individual destiny. It insists we take our unique gifts and talents, add our hard work and dedication, deposit generously into the dream accounts of others so that combined with a little bit of magic, we can all rise to our very best, to further the larger story, pass along a greater legacy, and fulfill our part in life’s ultimate design. . ."
I really like this quote: "Be All You Can Be. It’s a motto that doesn’t require all of us to become doctors or generals or astronauts or best-selling authors (though some of us will), but it does demand that we embrace our individual destiny. It insists we take our unique gifts and talents, add our hard work and dedication, deposit generously into the dream accounts of others so that combined with a little bit of magic, we can all rise to our very best, to further the larger story, pass along a greater legacy, and fulfill our part in life’s ultimate design. . .” If there are review copies available of the book, I would be interested. Thanks! "Be all you can be" represented an invitation to obtain valuable training and experience while serving our country, securing, protecting and defending the U.S.A. "Be all you can be" was an offer to expand your horizons. It included an opportunity to attend college under the Veterans Education Assistance Program. It's about self-development, more fully realizing your full potential. It isn't "Do it all" or "Have it all." It's "Be All You Can Be."